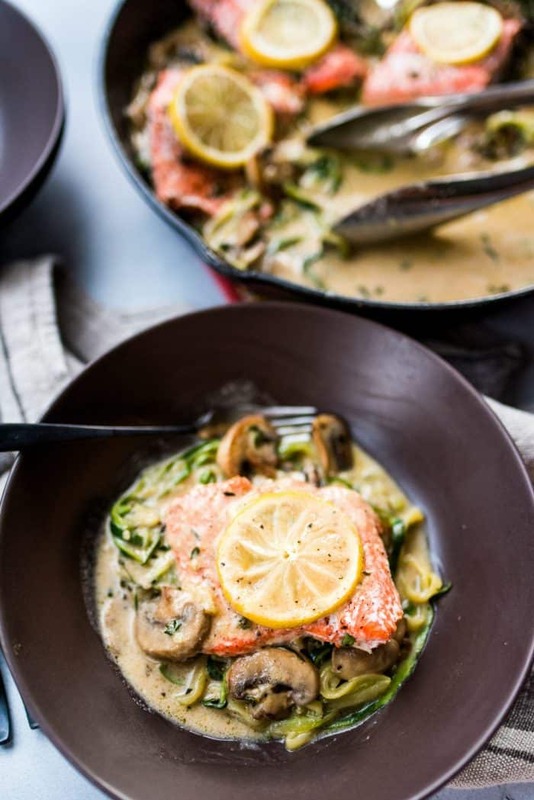 Salmon Mushroom Zoodle Marsala is a main dish served on zucchini noodles (zoodles) and mushrooms. 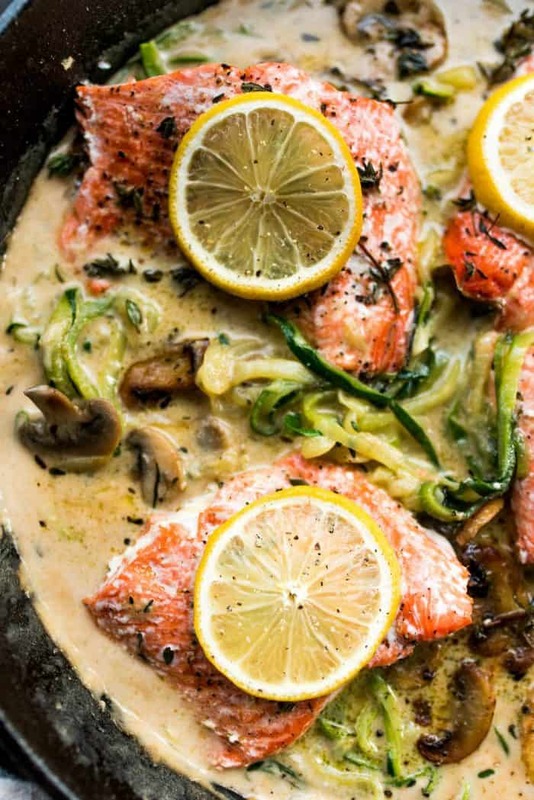 It’s a spin on Chicken Marsala, but with salmon filet. Friends, I’m an extrovert, and I really like feeding people. 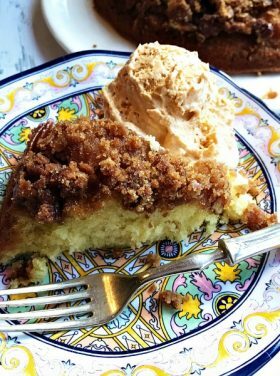 So I get excited about new recipes. 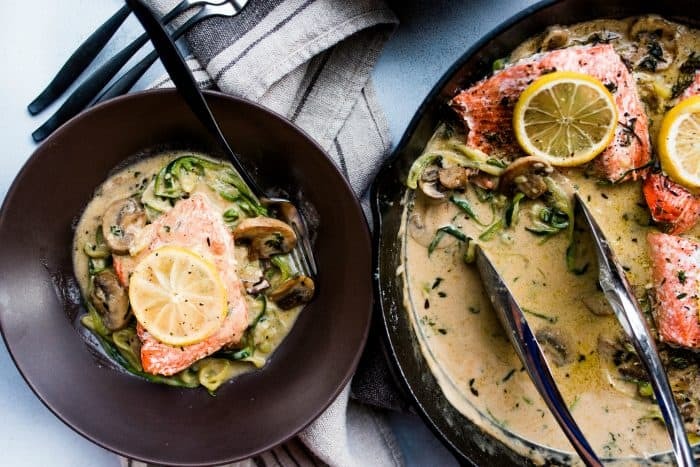 This Salmon Mushroom Zoodle Marsala is super yummy, and I’m happy to share the recipe with you today. But first, a lot of people are intimidated by salmon. I think dinner guests really LOVE salmon, especially if it’s cooked right. 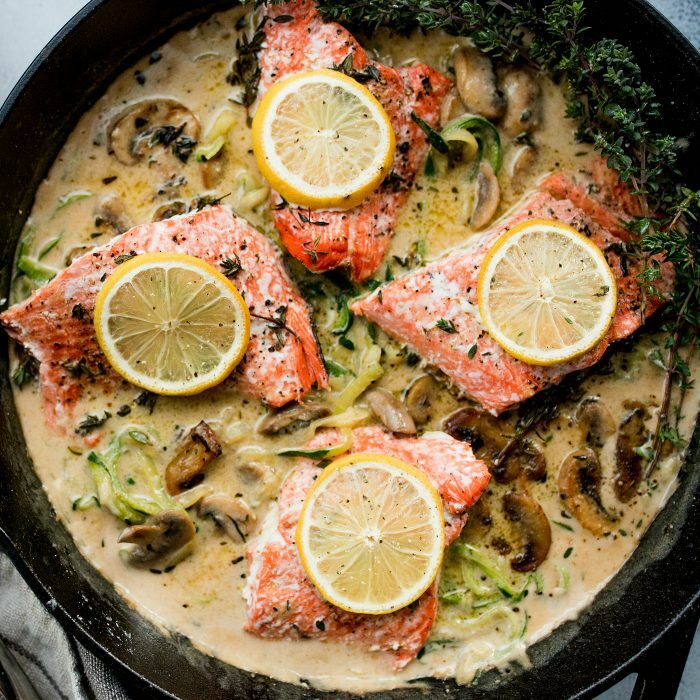 I have a ton of salmon recipes on my blog, so use the “search” magnifying glass on top of my blog, and type in “salmon.” A whole bunch of recipes will come up! I’m often asked, What are the benefits of eating salmon? Salmon is so good for you, we eat it at least 1-2 times a week. 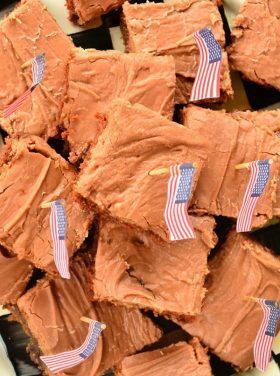 It’s packed with omega-3 fatty acids and vitamin B12. It also aids in brain function, cognition, and neurological health. The poly unsaturated fatty acids found in salmon also improve serum cholesterol and cardiovascular disease risk. 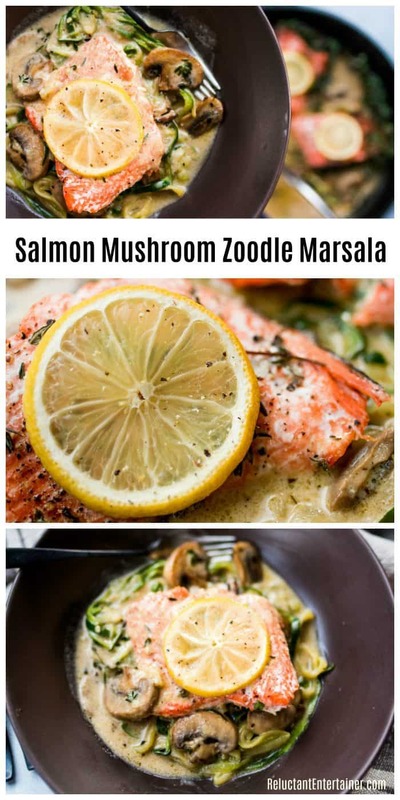 This Salmon Zoodle, and Mushroom Marsala, is a delicious meal for company, and easy to prepare. Always wash the salmon and pat it dry with a towel or paper towels. Prepare salmon filets by salt and peppering both sides. Line a baking dish or sheet with foil. Drizzle olive oil on the bottom to prevent sticking, then lay down the filets. 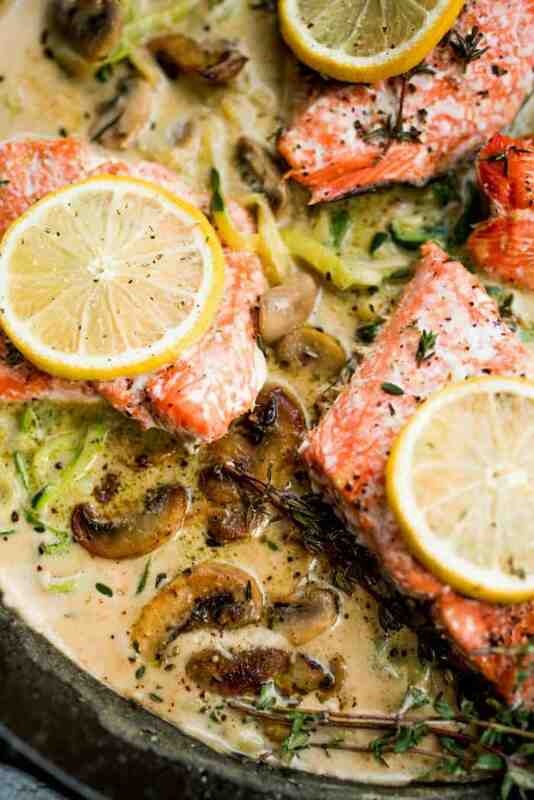 Prepare the salmon by sprinkling with remaining thyme, squeeze 1/4 lemon, and drizzle with olive oil. I was reading the cover story of the new Magnolia Journal, The World Needs Who You Were Made to Be. 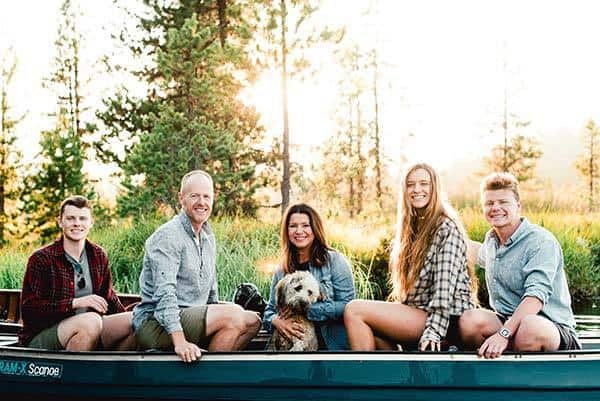 I think about being authentic in our homes and with the people in our lives, that honestly, if you don’t live this way (being real and open), then it will catch up to you. I’ve been writing about hospitality for 13 years now (I never dreamed I would have a blog for 13 years!) and it’s just in my DNA. I learned so much from my parents, and like I mentioned above, I really love to feed people. I can’t imagine not doing what I was called to do. Being real with our gifts, being honest and open with people, helps us be authentic. There’s a connection that I feel when I cook a meal for people and we sit down to eat it together. It does something for my soul. 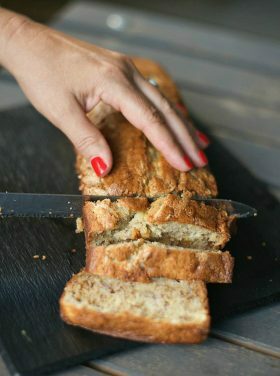 This winter, start collecting and trying out some soulful recipes, invite some new people into your home (or think of who you have not connected with in a very long time). 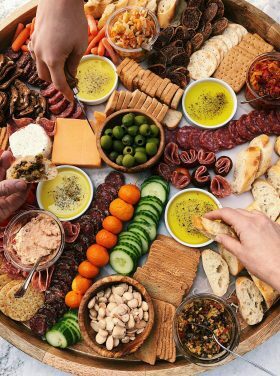 Grab a new cookbook, maybe serve a charcuterie board for the main meal. Try something new! 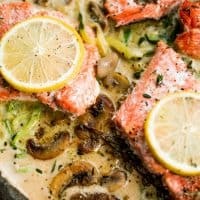 My daughter actually came up with this salmon recipe! 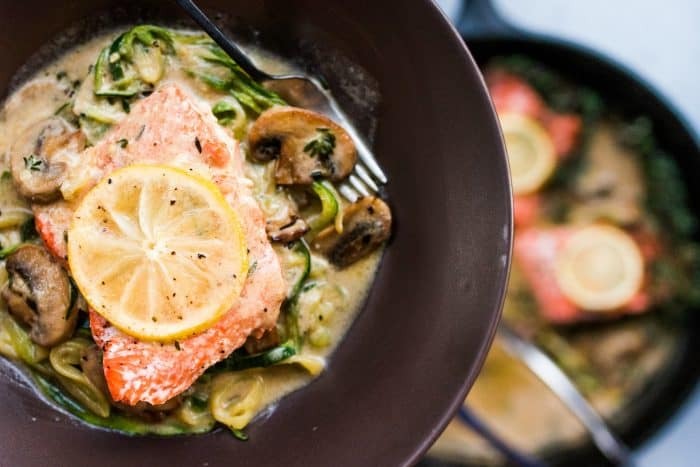 This recipe is a little involved, great for winter cooking, with zoodles (zucchini noodles), sauce, and salmon. 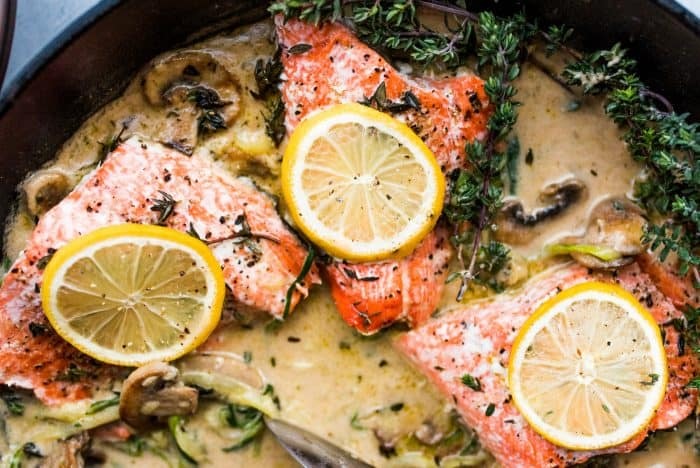 Prepare salmon filets and bake. Be careful to not over bake! When salmon is done, remove from oven, carefully remove from foil, and gently nestle into the zoodles and sauce. Serve hot! Your guests are gonna love this, I promise! In a large skillet, heat 1/4 cup olive oil. When hot, add mushrooms and toss in oil, cooking for 4-5 minutes on high heat, or until they begin to brown. Add in salt, pepper, a splash of white wine, and 1 Tbsp thyme, and stir. Sauté on medium-high heat to allow mushrooms to continue to brown—8-10 minutes total. Remove from heat and set aside. 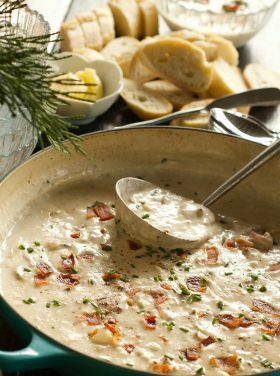 In a large saucepan, add coconut milk and chicken stock. Bring to a simmer on medium heat. 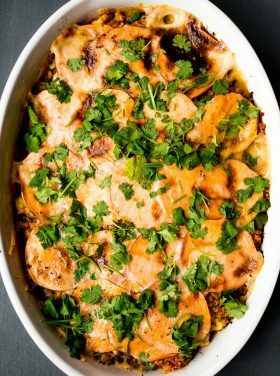 Lightly whisk in white wine, paprika, garlic powder, 1 Tbsp thyme, salt and pepper to taste, and arrowroot powder (optional). Allow sauce to reduce down for 30-40 minutes. The sauce should thicken slightly. Add zoodles to sauce, and simmer until zoodles are slightly tender, but still crunchy—about 5 minutes—then reduce heat to low and mix in mushrooms. Prepare salmon filets by salt and peppering both sides. 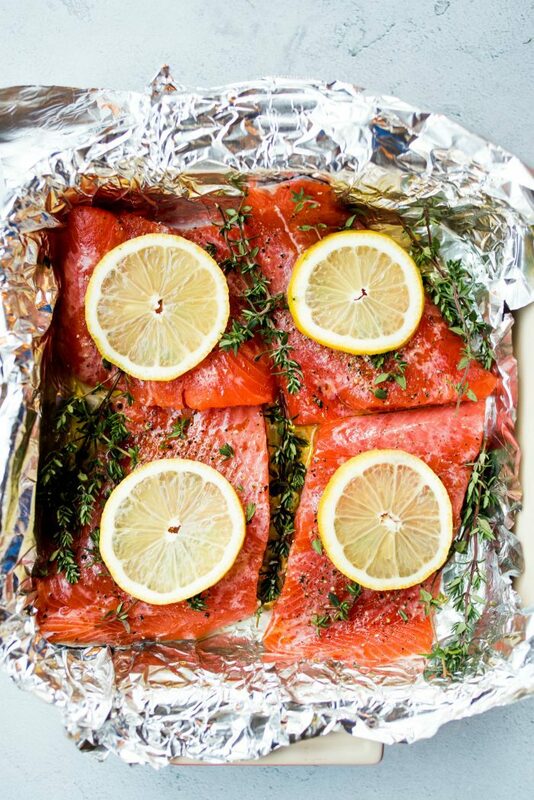 Line a baking dish or sheet with foil. Drizzle olive oil on the bottom to prevent sticking. Then lay in filets. Sprinkle with remaining thyme, squeeze 1/4 lemon, and drizzle with olive oil. Bake in oven for 10-12 minutes—be careful to not overbake! For dietary reasons, we used garlic powder, but you can use real garlic! Just heat 2 Tbsp of olive oil in the sauce pan, and then add 2 Tbsp of garlic to the oil, and brown for 3-4 minutes on medium-high heat before adding coconut milk and chicken stock! 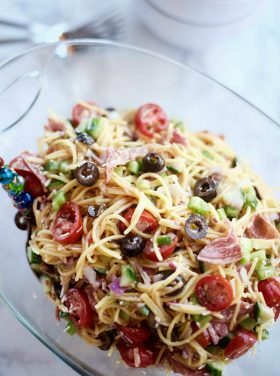 You can also sauté the zoodles and add them to the sauce! 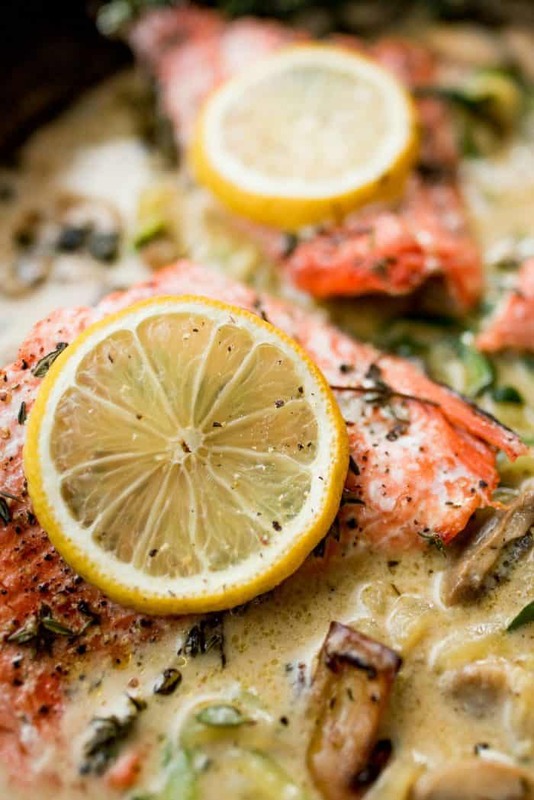 More salmon recipes: Roasted Garlic Tomato Salmon Filet, BEST Pistachio Lime Baked Salmon, Salmon Spaghetti Carbonara, Perfect Air Fryer Salmon, and Avocado Salmon Rice Bowls [Will Cook for Smiles].